My favorite food actually isn't Turkish, its Asian. What has this got to do with Hummus? nothing but Hummus and falafel are probably nearly on equal footing as Asian food or a very close second. I don't know what it is about Hummus maybe its just the taste, the texture who knows. Turkish people do eat this and whilst it is not eaten everywhere or even known throughout Turkey you can find this in Antakya and Hatay. Alot of Turks would even say its not a Turkish dish, the Arabs would say its theirs the Israelis claim it as well. The fact is that alot of the Middle Eastern food is very similar with some of the dishes crossing over boarders and Hummus is one of them. As a result many countries will claim this divine dish as their own. Speaking about Divine I happened across a blog devoted just to Hummus and they have an excerpt on there from Israeli writer Meir Shalev who says he can prove it is Israeli as its origins can be found in the Bible, the old testament. The first time Ruth and Boaz had met in Bethlehem, he offered her some humus: “And at meal-time Boaz said unto her, Come hither, and eat of the bread, and dip thy morsel in the vinegar” (Ruth 2-14). This is a mistranslation of course. The original word in ancient Hebrew, is “Hometz”. Which not only sounds a bit like “Humus”, but also resembles the word “Himtza”. The Hebrew name of chick-peas. True, “Hometz” in modern Hebrew is vinegar. But you don’t really think Boaz was so rude as to offer Ruth to dip her bread in vinegar, do you? Got to admit it’s more reasonable to think it was Humus. 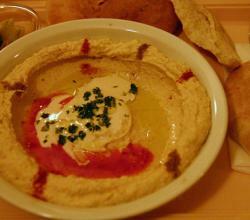 Not only are the origins of Humus ambiguous but so is the recipe or should I say recipes! As people are very different, recipes also change and are different depending on where you come from. Syrians might like more tahini whilst I have heard Jordanians like more lemon so therefore the recipe is slightly different depending on where you come from. Most of us have probably bought a tub from the fridge section in the local supermarket and so have a basic idea on what is involved in the final product. I have given you the recipe for this in my Meze post before. I thought it deserved another honourable mention when I saw a few videos about Hummus on youtube. This second one will show you how to serve it perfectly for your next dinner party or lunch. The guy dresses it up with pine nuts but I really think it would be much more appropriate to serve it with a few boiled chickpeas. As Ruth eventually fell in love with Boaz, it does seem much more reasonable that that gazed into each others eyes across a bowl of hummus rather than vinegar. Unless it was aged, rich, sticky balsamic vinegar- but I don't think that's very likely! I think the smell of the vinegar would cause any romantic feelings to wane dont you whilst the smell of a good hummus stirs the appetites. That's a great story, I hadn't read about Meir Shalev's theory that hummus is biblical. I definitely agree that foods can belong to multiple cultures! Where people and food all originates from has always interested me. If you look at Turkish and Greek dishes you cant help but notice alot is the same and the rest very similar. All through the middle east we can see the same dishes allbeit under different names with a bit of regional flair.